Welcome to our football gift ideas page! Packed full of things for those who love football, we have found lots of football related goods, football facts, football gifts and football fun for you. From football jewellery to football clothing, you can kit yourself out in football merchandise or buy a football present for a football obsessed friend. The Thabto Subbuteo Salt & Pepper Grinders would make the perfect novelty gift for a football fan. Perfect to place on your table at a dinner party, they are sure to create conversation. Little menaces will have hours of fun with the Dennis the Menace Farting Football! Simply throw, kick or catch to activate lots of funny farting noises. Featuring printed images of Dennis the Menace and Gnasher, this soft fabric ball is ideal for indoor use. Football crazy? Football mad? The Personalised No. 1 England Fan Glass Beer Tankard is perfect for you. At least you'll be able to drown your sorrows in style the next time England lose a quarter-final on penalties. Perfect for penalty shoot outs or for sociable football games with friends, the Plum Premium Wooden Football Goal - 6 x 4 will provide hours of sociable outdoor play, encouraging children to enjoy physical exercise. Sports badge. Featuring a sparkling silver and black football. Baby footballs that have all the interactive features to keep your baby and toddlers happy. The ball contains a soothing chime ball, the fabric is soft and cuddly making the friendly Little Champ Football a great toy for your little one. Our terrific and ever popular novelty England Hard Safety Hat in brightest red. This top quality safety hard hat certainly makes the point – English and proud of it! Football Bubble balloon delivered on the morning of you choice to any UK address. Bubble balloons are made of stretchy see-through plastic and are perfectly round! Delivered as a single or in a bunch of 3 or 4 balloons. Stay stylish on dressed down days with this printed tee. England Football Fairy in red, The pack contains a dress with wings and cape and the pack also includes a football wand. He is Football Crazy, football Mad, then this is the perfect hat for him (or her!). Made from poly foam this striking ball hat is about 40cm in circumference, soft and lightweight to wear. Football Crazy Walltastic comes with each player in an all white strip for you to colour in. Fill in your own score board too. Highly detailed, unique, 3D, computer-generated murals. Suitable for Tots to Teens. Easy to put up in 12 pieces. For kids bedrooms, Nursery, Playrooms or Games Rooms. Red, white and blue coloured strap watch with England wording on the strap and dial. Round full figured dial with football photo dial. Regular hands. This stencil enables you to make large football themed cakes. You can make cakes for themed parties, boys' birthdays, or just so the family can sit down with a cup of tea and slice of cake whilst watching the match! Sterling Silver Charm. Football Design. Multi-Coloured Enamel Detail. To be Attached to Thomas Sabo Bracelets and Necklaces. Test your skills with the dead ball in the penalty shootout and spot kick zone. Take freekicks and penalties and see if you can beat the goalkeeper and score. Use The Football Book (previous ISBN 9781405360586) to find out about the laws, the tactics, the science, and the art of the beautiful game. With a fantastic cover that feels just like a football, it's a great gift for football lovers and sports enthusiasts alike. 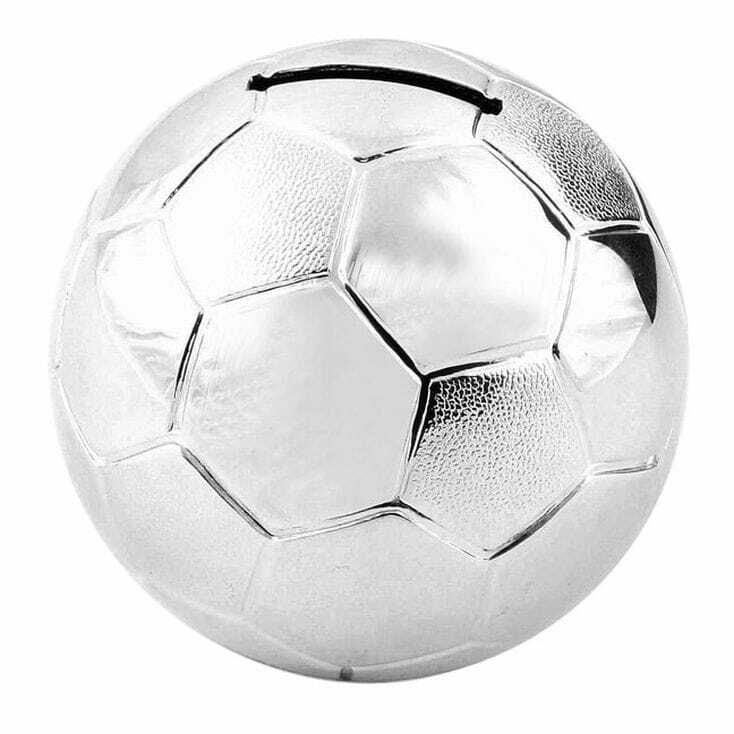 Score the winner with these silver plated football boot cufflinks. This fabulous Harvey Makin Football and Tie Pin gift set would make the perfect gift for the ultimate football fanatic! On the front is an image of a football and withing the image you can personalise with a name using up to 12 characters. No more just kicking your socks off – now you can kick them about thanks to these super funky Football Ball Socks – a pair of socks which when rolled up look like a football! This boy's pack of socks from bluezoo offers five soft cotton rich pairs in bright striped and football logo designs. 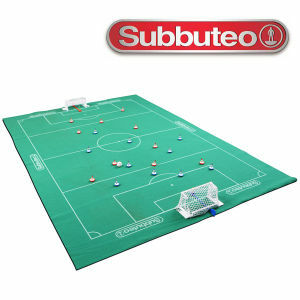 Subbuteo, the classic table football game is back. For those who missed out the first time round, or are too young to have been part of the craze, then now is your chance to join in the 'flick to score' game. A favourite of the football fan, this finger football game has become an icon in the world of sports games. Kit consists of 1 x 5 x 3ft England flag, 2 x 3m flag bunting, 20 assorted red and white latex balloons and 12 England hand waving flags. The book is personalised with the name of your chosen football team, plus the words "Researched for and presented to (name of recipient)" gold embossed on the front cover. Perfect for the budding soccer star, this neat little pop up goal is quick and easy to assemble and then neatly folds away again when playtime is over. Now you and a friend can experience a tour of the incomparable Wembley Stadium. Explore England's changing rooms; walk in the footsteps of heroes, through the players' tunnel towards the hallowed turf, and stand triumphantly in front of the Royal Box with the Replica FA Cup. Until you step foot on the pitch for real, the only way to experience all this and more is to book your Wembley Stadium Tour. This life-size, cardboard cutout figure of David Beckham, makes the perfect decoration for your Sporting Fun themed party or a great present for any fan of football. Calling all Manchester United fans!! Now you can have your own Fred the Red mascot Pillow Pet! Soft Foam Football, from Hamleys, perfect for indoor and outdoor fun! Kick it, throw it, catch it; this lightweight soft Foam Football is available in three colours and one will be picked and supplied at random. Foam Football is ideal for younger children because of its easy-grab, lightweight foam. Hamleys Foam Football is a great way to develop childrens early co-ordination skills. Expertly made in England by Easyart, this quality giclée print is produced using museum standard materials, providing rich, vibrant colours. Throw a disc, catch a ball! Phlat Ball is a unique toy that transforms from a 9in flying disc to a 6in diameter ball when thrown. Its soft plastic, flexible material provides a comfortable grip for active play! Three cool colours to collect: red, yellow and blue. This jersey t-shirt from Ben Sherman comes in navy with a football print and a logo detail. Also available in big and tall sizes. 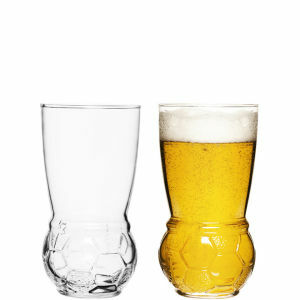 The two pack of Sagaform Football Beer Glasses would make a perfect gift for any football fan. Made from clear borosilicate glass, these quirky glasses have a round base which is shaped like a football. Dishwasher safe, they're perfect for enjoying a cold beer whilst you watch the match. Remember to visit our blog for for even more gossip and facts about football! Get ready for some football fun with this adorable black Labrador. Maxi poster. These authentic engravings and etchings have been hand-produced using genuine steel or copper intaglio plates, some of which date from as far back as the eighteenth century. Each impression is crafted individually and entirely by hand, in the same manner as the copperplate printer of centuries ago. The coloured versions of these prints are then hand-coloured by skilled artists, to create an extremely high quality collector's item. Looking for a stool for your little boy's bedroom? This soccer stool is the perfect fit - not only does it look decorative and unique - it also provides a practical seating solution whilst not taking it much space. Less than half price! Red England 1966 No 6 football shirt 100% Cotton. St George flag cufflinks. 100% Metal. Was £10 now £7!